The 13th Warrior, John McTiernan's adaptation of Michael Crichton's novel "Eaters of the Dead," was hampered by delays which caused countless release dates to be set over the course of more than a year, and at one time it was actually rumored to be headed for a straight-to-video release. 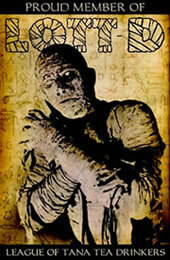 Delays and rumors like that usually denote a film riddled with problems. The 13th Warrior has its share, but it's a much better film than you might guess, offering an engaging period piece about an Arab unwillingly recruited into a Viking warrior band to fight off an "evil force" afflicting their people. The period film aspect will undoubtedly turn some of you off immediately. I'm not a huge fan of period films, either, as a rule, but if they're done more to offer an other-worldly aspect, to create an atmosphere that would be impossible to create in a present setting, and not as pretentious, "this is serious theater" exercises or pretentious, ostensible "historical artifacts," they can win me over. For instance, Gladiator, a period film, is on my top ten list for 2000. The period aspects of The 13th Warrior are more for other-worldliness and atmosphere. Antonio Banderas plays Ahmed Ibn Fahdlan, an high-ranking Arab who had the hots for one of his political leader's women. This obviously didn't lead to good relations, and he is banished to be an ambassador to northern territories. His caravan (which includes Omar Sharif, in a role that is typical for him and made me frightened that The 13th Warrior might be a period film of the latter sort, instead) encounters threatening Tartars. The caravan flees in the opposite direction. Suddenly the Tartars hold their distant position. The caravan understands why almost immediately, as a Viking ship approaches on a nearby river. The caravan half-heartedly tries, but cannot avoid an encounter with the Vikings, which turns out to be peaceful. In the next scene, a young Viking messenger approaches -- the son of a Viking king -- and asks for assistance from an unspeakable menace, the "Eaters of the Dead." The Vikings consult a sort of Viking enchantress, who informs them that 13 warriors must depart. Twelve are Vikings who gladly volunteer. The 13th, the enchantress informs them, must not be a "north man." That's the setup, occupying the film's first ten minutes or so. 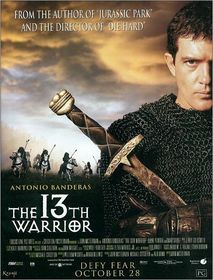 Of course, Banderas is selected as the 13th warrior by default, even though he's not really a warrior. The beginning moves fairly slowly at times, and more than once seems headed towards a staid, pretentious period piece. If you stick with it, and pay close attention through this talky (and foreign-language infused) beginning, your patience will pay off. Once Banderas is recruited, The 13th Warrior gets down to business, and evolves from an Elizabeth prequel to a pleasant, slightly horrific (at least there's plenty of blood and implications, although not realizations, of a supernatural theme), gritty fantasy fest that could just as well have taken place on any world, at any time. Still, I wouldn't edit out the intro or change the setting. Much of The 13th Warrior's impact, and crucial plot developments, are fueled by the "odd man out" theme, and making the odd man out an Arab to a band of Vikings both provides depth, at least from our misconceived grade-school stereotypes of those cultures, and saves McTiernan from having to spend a lot of time with character backgrounds, allowing for more adventure/action, which is what this film is really about. Unfortunately, as good as McTiernan is at creating the appropriate, somewhat surreal atmosphere, and as good as some of the suspense and action are, at least two major battle scenes are so darkly lit, and contain such quick cuts, that you can't tell what the heck is going on. Often, directors do this on purpose when the action isn't well-choreographed or when characters are fighting creatures in schlocky costumes, but that isn't the case here. That the scenes are pivotal brings my rating down at least a point and a half. Of course, the characters were supposed to be in darkness in those scenes, but the audience must be able to witness the action or we're immediately disengaged as a shadow dance with a soundtrack unfolds before us. I can only guess that the bad lighting was accidental and for whatever reason they couldn't reshoot the scenes. Later battle and adventure scenes save the film, however, and perhaps in realization of the problem (although it also serves a couple important plot points, as our heroes' predicament changes), the final showdown occurs in daylight, with an overcast sky and heavy rain to better supply the gloom element. The cast and crew of The 13th Warrior do many things right. Highlights include a trek into the enemy force's lair, a Viking "duel" which teaches Banderas an important point in the art of war, and the final battle. There are many minor highlights as well. As long as you aren't complete averse to period films, and you don't expect to see a film without flaws, The 13th Warrior is well worth a couple hours of your time. Submitted by Rancel (not verified) on Mon, 2013-07-22 13:32. Submitted by Bob of Bonsall (not verified) on Wed, 2013-08-14 13:01. Am I the only person who recognised the alusions withinthe film and the book to the Beowulf legend? And yes, I did enjoy watching it!